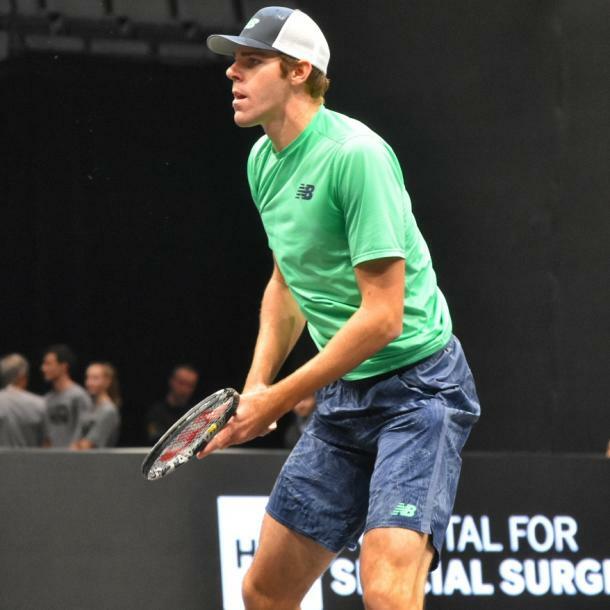 The American had a breakthrough week on Long Island thanks to clutch play in the later stages of matches and his big serve. 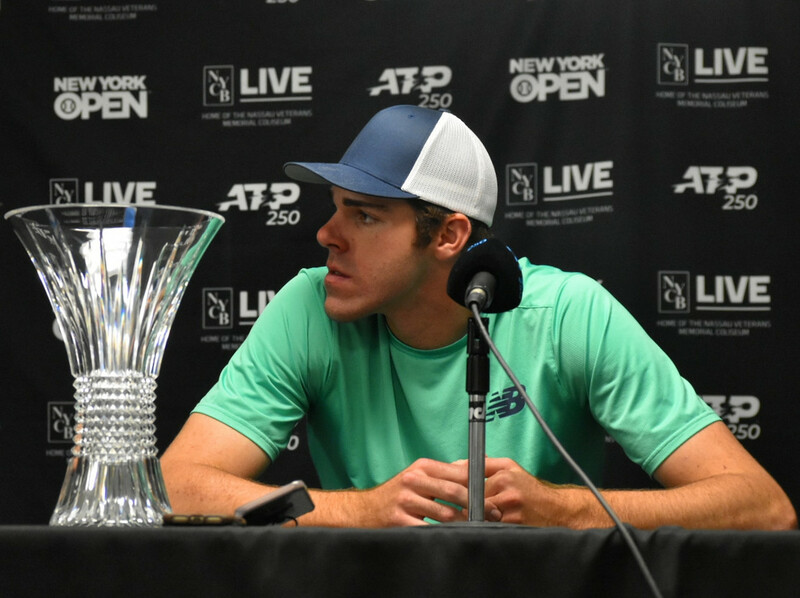 New York Open champion Reilly Opelka met with the media following his 6-1, 6-7 (7), 7-6 (7) victory over Brayden Schnur in the final. 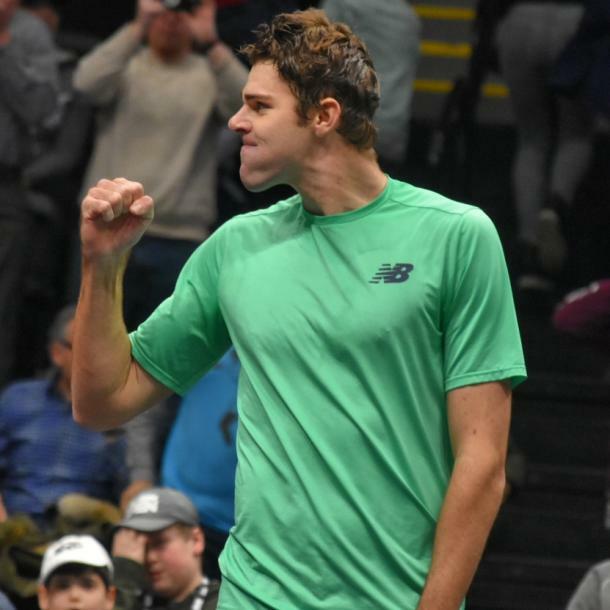 The 21-year old claimed his maiden title in dramatic fashion, winning a third set tiebreaker in both the semifinals against top seed John Isner and Schnur. 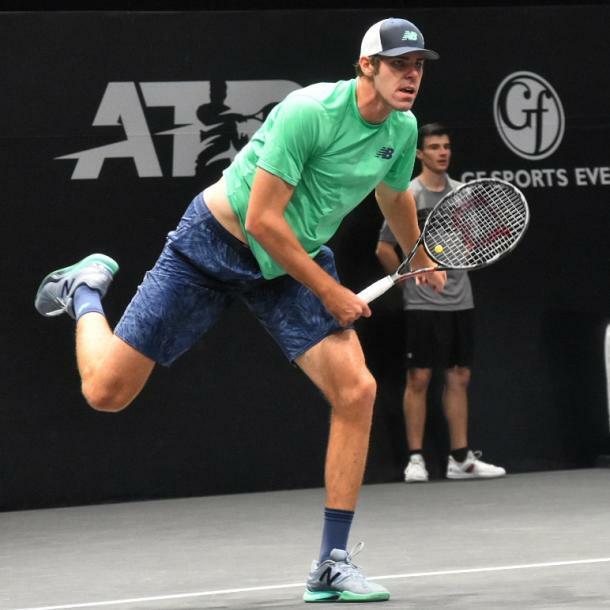 Opelka was at his best in the clutch, winning five of eight tiebreakers in Long Island while also rallying from a set down in his opening round match against fifth seed Adrian Mannarino. The tournament victory takes him to a career-high 56th in the new rankings. Asked what changed in his game to allow him to win the title, the American said "first of all was in my match with [Adrian] Mannarino, my first serve percentage was 48 percent in the first set. I lost 6-2 and that number is way too low. I should be around 70 percent. "So I made an adjustment first with my toss on my serve -- moving it further in front -- and I think I served 70 percent or higher every single set after that. So that was one, and then after my match with [Denis] Istomin I wasn't happy with my return of serve, my forehand, and I made some adjustments there and started paying more attention to my follow through. "That helped my forehand a lot. As the week went on I progressed a lot with my tennis, and by keeping myself in those matches when I wasn't playing well gave me the opportunity to fix it". "Today was tough. I felt like I had a lot of opportunities throughout the whole match and I thought in terms of the scoreboard I was looking pretty good with break points, good first set, and obviously match point on my serve in the tiebreaker in the second. "So I put myself in a good position throughout the whole match. And third set breaker could've went either way. That challenge was probably the difference -- that first serve he hit. It was 7-7 or 6-6 or whatever it was and that was probably the biggest difference in the match". On what this title meant to him, Opelka said "this is definitely my biggest title yet -- the one i'm most proud of for sure. It's been a lot of years coming as you remember from probably 2005 with Tom Gullikson back in Palm Coast, so it's been a million people along the way. So many different people have helped me", he continued. "Now I want to go a lot further than this even". He spoke about his mother being attendance: "she probably looked calm [but] I don't think she was calm. Yeah, that was awesome, my mom's been amazing to me through all of this. I mean, she was driving me one hour up north to Ponte Vedre [Florida] to practice twice a week. "Her commitment is unreal - and her love for tennis is something she shared with me. I remember us going to the courts when I was 10 years old in Grand Haven at like 10pm. Yeah, my mom, i'm really happy she was there". He talked about shaking off the disappointment of losing the second set tiebreaker: "it definitely was [difficult]. I was disappointed with how I played, with how I hit that point over, and even the next point. I played kinda soft, and that's not my style. I don't know, I was more disappointed how I went about it was opposed to the outcome. "They (tiebreakers) won't always turn out that way for me. Look at John [Isner] --- yesterday with a match point on the serve. He's a very clutch player I would say, so I think just with our styles there's going to be moments where it goes my way and I play clutch in those moments, and then obviously there will be instances where it doesn't. It's just kinda something similar with our style of play". "I thought pretty much every ball I challenged was out --- and they were all in", the 21-year old said. "I figured i'm not going to challenge that call, I have a few extra, and it was 7-7 in the third set breaker. If it's near the line i'm going to challenge. "Yeah, they do", he said the challenges taking a long time to show up. "Sometimes today they were quicker than in the past. That call [the winning point], that one there, was quicker. I mean there was some that took a while, but I thought today was pretty good". "It's hard", Opelka said. "I mean just general there's really two. 'd say mentally, obviously losing a lot of first sets, coming back from tough situations, and then also my first serves. I always talk about the serve percentage, you look at last year compared to this year, there is a night and day difference. "That's the difference, in tiebreakers especially. Playing a 16-point or a 30-point tiebreaker, and i'm hitting one second serve the whole time, I mean that's critical. That's the difference between winning and losing. "I'm [still] going to [Delray] Beach this week. I'm flying out tomorrow. Taylor Fritz made it to #40 in the world and he won a Challenger two weeks ago. So I definitely wouldn't say they're behind me, no. The opportunities for bigger tournaments are definitely there now and it just makes everything easier in my schedule knowing where I can play".